You may find the original text at Sea Warrior Developer please use the original link - it's free. by structuring and integrating (a) the intangible assets and (b) the subjective value metric. Thus leading to more sustainable and human economic systems. With bengin's enhanced value metrics you may draw, show and communicate - in addition to US Navi's 5 Vector - combinations of Individual Performance Vectors (IPV), leading to 'Group Performance Vectors' (GPV) and therefore visualize solution for developing Groups as a system. If you are interested in multi-dimensional valuations and performance measuring you may find additional information at: http://pma.bengin.com. Rear Admiral Ann E. Rondeau graduated in 1973 with a degree in history from Eisenhower College in New York, where she was selected by the board of trustees as most distinguished graduate and received the Groben Award for Leadership. Upon receiving her commission from Officer Candidate School in 1974, Rondeau reported to the commander in chief, U.S. Pacific Fleet, Fleet Communications. In 1977, she reported to Patrol Squadron 50 as the intelligence officer and subsequently also served as the squadron operations officer. From 1980 to 1982, Rondeau attended Georgetown University, earning a master’s in political science. From 1982 to 1983, she was assigned to the Navy staff in the NATO/Europe section of the Strategy, Plans and Policy Division. In 1983 she was assigned to the Office of the Secretary of Defense as assistant for policy analysis with follow-on assignment to the Office of African Affairs. In 1985, Rondeau was selected as a White House Fellow, serving as special assistant to the attorney general for national security affairs. Rondeau assumed primary duty as executive officer of Fast Sealift Squadron One in 1987, with additional duty as officer in charge of the Military Sealift Command (MSC) Unit, located in New Orleans, LA. During this tour, she earned her surface warfare qualification, training on both MSC Merchant Marine vessels and U.S. Navy combatants. She reported to the Chief of Naval Operations (CNO) Executive Panel in 1989 as assistant for political-military analysis. From 1990 to 1992, she served as second battalion officer at the U.S. Naval Academy and also as officer in charge of plebe summer training. Rondeau served as commanding officer of the Naval Support Activity, La Maddalena, Italy, from 1992 to 1994, with follow-on assignment as a CNO Fellow on the Strategic Studies Group, in Newport, RI. From 1995 to 1996 she served as military assistant to the principal deputy undersecretary of defense for policy. From 1996 to 1997, she was assigned to the Navy’s Quadrennial Defense Review Support Office. Rondeau served as commanding officer of naval support activity Mid-South from 1997-1999 in Millington, TN. Under her leadership, the base earned a Tennessee Quality Award. From 1999 to 2001, she served as the commander in chief, U.S. Pacific Fleet Staff as the deputy chief of staff for shore installations. 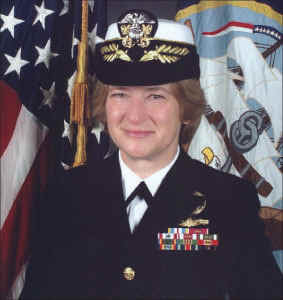 She took command of the Naval Training Center Great Lakes November 9, 2001. Under the direction of CNO, a new naval education and training architecture was developed to include the restructuring of Naval Training Center Great Lakes. Rondeau was designated commander of Naval Service Training Command (NSTC) and the command was stood up on June 30, 2003. As the NSTC commander, she was responsible for the execution of all enlisted and officer accession training programs, with the single exception of the Naval Academy. Rondeau was also designated commander, Navy Region Midwest (CNRMW), in charge of base operating support for activities in 10 Midwestern states. In addition, she was operational commander over most of the major tenant activities at Naval Station Great Lakes. Rondeau assumed command of Naval Personnel Development Command on November 5, 2004. In this capacity, she is responsible for the individual technical and follow-on training of sailors. Her personal awards include the Defense Superior Service Medal, Legion of Merit (2), Defense Meritorious Service Medal (2), Navy Meritorious Service Medal (2) and Navy Commendation Medal (3). MT2 Editor Jordan Fuhr interviewed Admiral Rondeau. Q: Admiral, how would you describe your mission as commander of Naval Personnel Development Command? A: Simply put, we develop sea warriors. And when I say develop, I mean we provide sailors the tools they need to grow professionally and personally throughout their careers by providing access to lifelong learning and the ability to take control of their development as a sailor and as a person. That said, the mission of NPDC, and it is called Naval Personnel Development Command on purpose, is to focus on the individual and the individualization of training. And with that focus in mind, we integrate, standardize and support our 14 learning centers in delivering knowledge the sea warrior needs to satisfy fleet requirements not only in terms of filling requirements, but also in terms of characterizing the performance of those requirements; all, of course, with the view toward fleet readiness. NPDC is all about providing the fleet with sailors who are mission-ready. Now understand, we don’t do that all by ourselves. We are guided by the chief of naval operations (CNO), by Sea Power 21, by OSD guidance and the joint guidance we get. So we don’t do that all by ourselves. That, in a nutshell, is what our mission is. And all we do is geared to a few things. One is fleet readiness, and the other is how we help the human capital strategy of the Navy work across the spectrum of capabilities and the end-to-end look of our Navy. Something of importance, as a military technical training focus, is that we are very much involved with taking the individual and seeing how the system works from the acquisition of buying things and then making things work through the entire end-to-end processing of systems, so that we are no longer so focused on how the individual fits the system, but how the systems can fit the individual to optimize the system to achieve greater operational effectiveness. We are all about providing sailors the right training at the right time in the right place and at the right cost to ensure fleet readiness. Q: What are some of your goals as the new commander of NPDC? A: One of the goals that you always need to have, especially when you are the second commander of a new command, is to ensure you are sustaining the transformation initiatives of the first commander, so that your team can continue their work. So one of my goals, personally, is to ensure that we maintain the momentum, the speed, the pace, the idea, the initiatives of our transformation. Certainly, our vision at NPDC is to become the world’s best workforce development organization. And we’ll do that, through the pursuit of innovations and technologies. But we are doing it grounded in the science of learning, with an idea of delivering lifelong learning opportunities to sailors. I will tell you that part of my goal is to make sure we maintain the constancy of purpose toward those things. But to achieve this we are certainly focused on the CNO’s various priorities, remembering that manpower is never dropped from being his number-one priority. When I first took command of NPDC, I put out a commander’s intent, and there were obviously a lot of details, like the right metrics and performance and all those things to address, but I also laid out core overarching areas I wanted the command to focus on—the six critical areas on which we need to focus: relentlessly drive transformation; develop sailors and our entire career total force; effectively inculcate into sailors their own core identity—what it means to be a sailor; collaborate with the best of breed, in terms of training people, that is inside or outside government; constantly operate with a 360-degree scan—what I’m talking about is that we do not exist as an entity unto ourselves and so to make sure we are constantly scanning the entire Navy and DoD and the business of training and education so that we know what we can do better. And then finally, I really wanted to have folks remember who they are, too, so I put in the six critical areas that they need to embrace a life balance. The team is working so hard, and I did not want the team to forget that in all of the work we are doing that life balance is really important, and we need to lead by example. Q: What do you mean by “life balance”? A: Our goal is to instill in our sailors the value of a life that is balanced. This involves effectively balancing physical, spiritual, moral and ethical aspects. If we talk about sailors having a life balance so that they are physically, spiritually, morally and ethically fit, we need to also understand that life balance ourselves. So, I want the staff to understand they need to be physically fit, they need to have time to reflect and think, as well as time to learn and execute, so that we are not only talking about it to sailors, but also doing it ourselves. I want my staff to also be engaged in lifelong learning. Q: And your other goals? A: I will tell you also in terms of goals as the new commander, I have given you one, constancy of purpose; two, I gave you a sense of my six critical areas in my commander’s intent; and the third one is moving along with speed, alacrity and agility toward the CNO’s human capital strategy vision and goals. Four, I need to be sure we are specifically implementing the delivery systems to make all of this possible: Navy Knowledge Online, the 5 Vector Model, the Integrated Learning Environment, skill objects development and human capital development. The mechanics of the delivery system that will allow us to really empower the sea warrior is also part of my goals. I think those four goals work. Then my fifth is that we continue to align training and education with manpower and personnel, because we are almost ready to embark upon a transformation that brings together manpower, personnel, training and education (MPT&E) into one holistic approach, which is huge. So, the fifth goal would be that we do everything we can to make this happen. Q: What challenges do you face in achieving those five goals? A: Well, there are always the personal challenges of making sure I’ve served my team effectively so that they serve optimally. I think that is always a challenge, and you want to be sure you are doing that right. From there, I would tell you that working with the other stakeholder commands to align manpower, personnel, training, acquisition, performance and operational effectiveness is always going to be a challenge. A third one that I think, frankly, is one of the biggest challenges, corporately, is to ensure we are matching IT capabilities with delivery requirements. That is always going to be a challenge. I think another challenge is to manage the expectations we set up for sailors, because our ideas are magnificent and our vision is electric and tipping-point stuff. You’ve got to be able to talk about it in order to get the dialogue going for good ideas. But when you do that, you may set up an expectation you cannot meet. So, one of the challenges is to match what sailors expect with what you are able to deliver. That’s a huge challenge. I think it is probably the greatest challenge of all. That, again, requires good IT systems and good IT integration. I think another challenge is horizontal integration—making sure that everybody is talking to everybody else and that we do not lose collaboration and integration for the sake of pace and speed, or that we do not slow down pace and speed for the sake of collaboration-coordination. You have to keep that warp and woof of the organization pretty robust and vital. Yet another challenge is integrating the human capital strategy into everything we do. What this means is that as we think about hiring, retiring, employing, managing, compensating, training and educating our people, as we think about paying, promoting, awarding and rewarding them. We must think Total Force and understand that there are end-to-end linkages as you thread these things together. It’s very hard to do, and it’s a really important thing to do. And a last challenge is to thread all this into the new civilian personnel system and to make sure we understand the stress of our civilian employees, but also the opportunities for modernizing the civilian personnel system and to make civilians an important part of the entire Navy human capital strategy. Q: You mentioned life balancing, so how are you further addressing the lifelong learning environment? A: I think there’s a three-pronged answer. One is the environment and tone you set. Two is the availability and access you give people. Three is understanding our priorities in terms of the global war on terror and the transformation we are going through as an entire organization as a result of it. Getting the balance right in those three areas is certainly a challenging and complex task. The easiest of them all, and also the one we tend to focus on more because it is knowable, is the access and availability—the delivery method. The lifelong learning environment for us is often translated into the 5 Vector Model and the Integrated Learning Environment. And that is right because that is the delivery system that provides the content access and the availability to continue lifelong learning. Another piece is leadership and how you set the tone for lifelong learning to have people engage in it. A lifelong learner has to walk into the learning experience with a goal in mind, saying, “that’s what I want to be.” So you need to inculcate in individuals and in your command climate a tone that says lifelong learning is valuable. And then with the pressures of the global war on terror and the organizational transformation, you have to balance your priorities. Part of the Navy’s delivery system is the 5 Vector Model and sailors’ access to it through Navy Knowledge Online. That access piece is very important because one of the things that we know about enlisted and officer sailors, and also about soldiers, airmen, Marines and coast guardsmen, is that you must provide them with some tangible sense that you mean what you say when you tell them you’re going to do something. We’re very focused on things like Navy Knowledge Online because if sailors have the right tone and command climate that says lifelong learning is valuable, and if their work schedule in supporting the global war on terror allows them to be a lifelong learner, and they are dedicated to their ship or squadron, and they cannot get online, what message does that send? When they try to log on to do what their 5 Vector Model says are is required for their progress toward advancement and learning to add better value to the mission and they can’t get access to that information when everything else is right, then they will be frustrated. So, we really need to deliver systems and Navy Knowledge Online to make this work well. That is a tangible reality of the lifelong learning environment, which is, again those three sides to the whole triad. Q: You’ve mentioned the 5 Vector Model quite a bit. Could you explain the program in detail and its importance? A: The 5 Vector Model is a sailor’s career roadmap and professional resume. It is individualized for each sailor and identifies all career milestones and learning opportunities that sailors need to progress from recruit to master chief or from ensign to admiral. The five vectors or areas of concentration are professional development, personal development, leadership, certifications and qualifications, and performance. The professional development vector focuses on occupational skills. Right now there are 89 enlisted ratings in the Navy covering everything from gas turbines to culinary specialists. Wherever possible, the Navy tries to closely correlate career milestones and training to civilian and industrial standards. Rather than duplicate the private sector, the Navy is now adapting training, where possible, to existing civilian training. To determine what sailors need to know and when they need to know it, NPDC conducted job task analyses. These analyses involved every Navy rating and determined what knowledge skills, abilities and tools sailors needed to perform a particular job. This information is reflected in a sailor’s 5 Vector Model in four progressive phases of mastery levels: recruit, apprentice, journeyman and master. So sailors can look at their model and see their level of skill mastery for their rating, as well as for the other areas like leadership. For example, say you have your 5 Vector model. On it we can see what you have accomplished or what is required for your certification and qualifications and licenses, in your leadership skill sets, in your personal development and in your development as a military professional, and also in your performance. So sailors see how they have done on those things and what the next step is in their progression of personal and professional growth. It is a precise mapping and measuring tool about where I am on my lifelong learning continuum and where I am in what I want to do and where I need to go, and eventually it will show where I am relative to others in my progression. It identifies learning resources that lead to achieving my milestones in my career, allowing them to identify and diagram different career paths. If I’m a hull technician now and I want to be a cook, I can figure out the skills gap and see what I need to do to make that change. It gives us the ability to measure our advancement potential against all others. So, there’s really interesting metrics here that we can gather based on the information in the 5 Vector Model. For instance, right now in the area of performance, I know how I stack up against all other machinist mates in my command. But I do not know how I compare against all other machinist mates in the Navy. Eventually the 5 Vector Model, through other processes that the manpower-personnel people will be able to give me, I will be able to see how I stack up against all other machinist mates in the Navy. It gives me a tool that allows me to identify and apply educational opportunities and choose duty stations as well. Now, back in 2001 or 2002, there was a feature article in the Wall Street Journal where CNO’s whole approach to training and education and personnel was outlined. They called it kind of a buyer and seller’s culture where I’m a CO on a ship, and I see that a sailor has done all these things—because I have access to his 5 Vector model—and I see that another sailor has done all these things—I’d have access to her 5 Vector model—but the first has some skills I really need on my ship. So I can use him, but if another CO also wants to use him, then we get a chance to negotiate with the sailor about where he might want to go. Maybe he ends up going to the other ship, so now the second sailor isn’t a bad choice. Since I might have to train her a bit more to come up to the first sailor’s knowledge level, then I, as a CO, may go up to my boss and say I need to train her now to get her ready for the next job. It’s an interesting approach to having a real sense about what individual sailors bring to you rather than just having a guy or gal show up to your quarterdeck and say, “Here I am,” and only then do you get a chance to look at their personnel jacket and see what training they may need. This allows you to anticipate and plan and gives the sailor a chance to also plan to be with you. So, the whole continuum addresses these five vectors with a view toward your growth and development, and it illustrates everybody’s qualifications and everybody’s needs. We are doing it through mapping skill objects and enabling each sailor to understand his or her career path. It is multidimensional. It is dynamic and agile and fungible. It is working and is integrated with the Navy’s Job Advertising and Selection System (JASS). What is important is that the architecture has been built. But remember what I said about what sailors expect and what I can deliver? Right now it is partly functional, not fully functional because we are still doing some populating of the information. We are still doing the integrating of MP and T&E processes and systems. It is the desired end state, and the architecture is good. The modeling is good. We are partly there, but that is the vision overall. Q: And this is available through Navy Knowledge Online (NKO)? A: Yes, it will be available on NKO. Of course, NKO is not only supporting the 5 Vector Model, but it is also there to support content delivery and e-learning, and it should be the vehicle for the entire Integrated Learning Environment for the most part. We’re putting all of it in one place so that when a sailor goes online he or she can go to one place—NKO—and not have to go to numerous Web sites. NKO has enormous potential. And although we are doing a spiral development of NKO, people are using it now. As of April, we had 469,248 registered users of NKO, and we average 15,000 users on NKO a week and 3,000 new users registering a week. That is because NKO is available to not only to active duty sailors but to anybody in DEERS with a Navy affiliation. That includes reservists and retirees, their dependents, civilians and contractors. Again, there’s a spiral evolution ongoing, and there are technical challenges and technological challenges and funding challenges and integration challenges, but it is being used. And we’re working on making it even more user friendly than it is right now because that’s part of the evolution of things, but it is the seed bed for all Navy e-learning, content development, the 5 Vector Model, viewing job information and personnel assistance. And we’re working really hard at making it the single source of information for sailors’ personal and professional development. Q: How has Task Force EXCEL affected NPDC? A: Remember that Task Force EXCEL [TFE] belonged to a family of task forces that CNO has been using as a tool toward change. It was one of his first and frankly, I think, in many ways without being too biased, one of his most vibrant and successful ideas. And although I am the new head of Naval Personnel Development Command, basically TFE was embedded into what NPDC has essentially become. Although we still have that moniker, it [TFE] was more a catalyzing agent than it was intended to be a lifetime sustainment organization. The overall tenets and vision set up through TFE are certainly ongoing at NPDC as well as the rest of the Navy through the Revolution in Training and certainly through MPT&E integrations. We have continued the idea, the vision that Task Force EXCEL started. What is important is what Task Force EXCEL has done for the Navy in a bigger context. We are not looking at return on investment based on the lowest price or the lowest cost or inferior equipment. Task Force EXCEL established a tone and philosophy and an attitude that says training and education are essential to operational effectiveness. They are not just ancillary things to consider by the by. The return on investment we get out of training and education is so key and so essential that we really want to understand it analytically and based on performance. We are considering much more than lowest cost; we are looking for the best value and best processes to meet mission. It has matured our Navy’s view of how we value sailors, both enlisted and officer. It’s made the science of learning and the science of manning part of our culture. It has made us see the human being in the Navy as knowledge worker—as a really valuable capital asset. So, what Task Force EXCEL has done, even more than in the confines of T&E and of NPDC, is to help us set a tone in the Navy that says the individual learner is critical, valuable and that we can indeed maintain high standards and still teach the sailor individually. That’s really fine work. Task Force EXCEL has done some marvelous things in setting a tone for our Navy that brings together machines and human beings in a way that truly is 21st century. Q: Where does the Revolution in Training fit into the picture? A: The Revolution in Training is a holistic view, and it encompasses everything I have just said. You measure differently, and you perform with an idea that training is geared toward the learner. The whole idea of the Integrated Learning Environment is critical because it brings together program management, functional and technical integration, processes, products and people, and the capturing, organizing, designing, validating and deploying of knowledge content. This is huge. In the past we have taken training, and I would say to a certain degree learning, and particularized it. Now we are not only particularizing it to the mission at hand, but we a re-generalizing it to what we all need to have for core knowledge or what we commonly need for operational effectiveness. We are doing it with an idea of modern delivery systems and bringing it to the fleet and using all kinds of technology and innovation and information systems to do that, but we are not losing grasp of the eye-to-eye, in-person effect of learning, teaching and coaching. The Revolution in Training, if it has done nothing else, and it has done much, has taken the whole-person concept and really brought it out to a potential reality that is really quite extraordinary. But, we are not there yet. I keep telling people that we’re kind of at the chimpanzee stage of the NASA program. There is great promise and a great vision and great potential, but we are just there at the extraordinarily exciting phase of discovery, of innovation. This has enormous promise, and I’m very proud of our Navy for what it’s doing. Q: What will NPDC and training and education look like in the future? Do you see it as more technologically focused through NKO or more live, face-to-face training? A: I think it is both. If you look at the learner as a whole, you’re not going to channel this one way or another. Certainly, young adults learn in context. Adults learn in context. So hands-on is really important because adults tend to learn by discriminating what’s important and what’s not important. Content is more knowable if you put it in context for an adult learner. With that in mind, you need to give them the hands-on to see why it matters, but you can give them the technology system to also do that. For instance, I was at our Center for Naval Engineering looking at how they are teaching some really involved engineering concepts through 3-D technologies. This is really important because you have to understand the current cohort of young learners. Many of them are relatively computer savvy, but they’re not mechanically very savvy these days. So what you do with a 3-D learning program is that you put students into an environment in which they are comfortable—the computer and screen—but you make what they’re working with look real and be real. You assess them in terms of learning—a strike against you if you perform poorly on tests. And while you let people go at their own pace, they are all held to the same standards. Now you’ve got some extraordinary ability to teach a highly diverse force. And you’re not only talking about diversity in terms of gender or socio-economic backgrounds or racial backgrounds, but now you can teach the same standards to a highly diverse, mentally formed group. If you come to the Navy and you’ve never had any experience in mechanics, I can teach you mechanics. It’s not going to always be in a group learning environment, but it will be in an environment where you can learn through some online learning and also hands-on. We call this teaching through different methods a blended learning environment. Another example is people who join the Navy who were not strong performers in high school. Their prior learning experiences were not always positive. These students are highly motivated in the Navy, and they want to do well in their academics. How do we help them succeed? We may teach them technical skills first through 3-D simulation to show how to make a perfect weld, for instance. Once they see how to do it in a simulation, then they have a basis of understanding for when they actually try it. They are learning it, but what’s really important about all of this is that they have begun to understand that they can learn through a computer, and that has not always been the life experience of some sailors. So if his or her learning experience is highly diverse compared to, say, the information technology expert who maybe has an associate’s or bachelor’s in computer science and comes into the Navy as an enlisted person, we know we can teach them a similar standard, but through different means. The vision here is that we can teach almost anybody through various media and through various delivery systems that conform to the individual’s ability to learn, know and then perform. Remember, also, that we are downsizing our crews on ships and we’re going toward a hybrid sailor. This means I could bring a sailor onboard a ship and, based on how I’ve taught him or her before they were brought onboard, I then can continue the learning and teaching experience while onboard, and I can take an electronics technician, a fire controlman and an information technician—three different ratings: ET, FC and IT—and create a hybrid sailor with any of those three skill sets who can cross the deck of a ship ready to work. So now I have one sailor doing three different jobs. Now I can create a 90-person ship, and I can cross deck with a versatile, “ready round in the gun chamber” sailor. That’s really, really phenomenal. But you do it by having a training system that allows you to do that and having training delivery systems that allow you to do that. Q: To enable all of this, how important is the partnership with industry? A: It is critical. Remember when I said that I want people to first of all seek out and work toward best practices? That’s across the board, including industry. Industry needs to understand they are not selling for themselves. They need to understand the Revolution in Training, they need to understand human capital strategy, and they need to understand where the Navy is going. I cannot tell you how often I have been approached by various industry reps working under old legacy thought processes about how the Navy needs to train and educate. There is also the other kind of industry rep who is trying to sell products that do not have the durability or ruggedness for use at sea. They need to understand that the Navy is changing substantially, dramatically and phenomenally, and also to understand that this change has some core requirements, and the Navy needs you to meet those. We have become smarter about how to buy; we’ve become smarter about what we need to expect, validate and require. I will tell you, there is no question that industry is an absolute partner to this and we can lead industry toward some various ways of thinking, and industry can lead us to various ways of delivering mission. This is a very adult, mature relationship, and I will tell you that when industry gets it right by delivering reasonable and appropriate systems, and we get right what we really need and require to make the next step, it’s a phenomenal relationship that I think has nothing but promise ahead for us. A: Yes. It’s important to remember what our training and education organization is all about: delivering a sea warrior to his or her operational environment, and to the fight, and also to maintain our operational effectiveness. So if we get the MPT&E organization right, we are going to be able to deliver a higher-end sea warrior to the fleet and then the sea warrior program ends up being able to deliver a workable human capital strategy for the Navy and the country. The importance of sea warrior as a whole is our focus. It’s been challenging to map out all the skills sailors need to perform, but part of this program is about respecting the Navy and respecting sailors. When you start to really study job task analysis and skill objects and the knowledge, skills, abilities and tools sailors need to do their job, you truly see how much work they do and you come up with a phenomenal and awesome respect for the men and women who wear the uniform—the cloth of the nation. You take that knowledge, skill and ability, and apply it to the human dimension of judgment, of intuition, of instinct, of will—you now have all that is good about our Navy and our sailors and you’ve just optimized it and made it truly eye-watering. So our commitment is to the sea warrior as a whole person and the sea warrior program as a system of systems and to bringing it all together. In about 1907 or so, we had a secretary of the Navy by the name of Josephus Daniels who changed the way we train sailors by saying that they needed training. They were not just an oppressed group of men who couldn’t find any other work but were pretty courageous and quite strong and brave, and we could train them to be technically smart. Josephus Daniels was one of the fathers of vocational education, along with some civilian educators. We are at the cusp of a similar revolution. The Navy, and I would dare say our joint brothers and sisters in the other services, are taking the whole person—soldiers, sailors, Marines, airmen, Coast Guardsmen—and approaching them as a capital asset and approaching learning in a way that even the education systems in the country are paying attention to. I think that in 2005, we’re on the same cusp of a revolution in how people learn and how we approach learners as Daniels was around 1907 when he declared we needed to send sailors to school. That’s a pretty phenomenal point to be at, and I am proud to be at that point of our Navy’s history. Also, I thank you [Military Training Technology] for what you are doing. As you can tell, I have passion about this and as soon as I start talking about it, I get more passionate. I do thank you for what you are doing. I think you’ve done some important work to bring together the technologists, the technicians and the human factors folks and you can help us to make a stronger military with what you do.